Applications are invited from suitably qualified candidates for admission into two (2) years Higher National Diploma (HND) and National Diploma (ND) - Evening programme. DURATION: Two (2) Academic Sessions of Four (4) Semesters. The National Diploma in the relevant field with a minimum of Lower Credit grade obtained from a recognised Institution, and a minimum of one-year post qualification experience. In exceptional cases, candidates with pass grade and a minimum of two years post qualification experience in the specific field may be considered for admission. In addition, candidates must posse five (5) relevant credit passes, including Mathematics and English Language at the SSCE, GCE, NECO, NABTEB and other O/L equivalent qualifications obtained at not more than two (2) sittings. 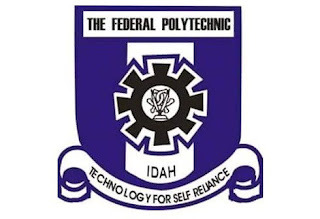 All candidates including ND graduates from Federal Polytechnic, Idah, are to mandatorily process and forward their academic transcripts and confidential reports to the Registrar for admission purposes. Five (5) relevant credit passes, including Mathematics and English Language at the SSCE, GCE, NECO, NABTEB and other O/L equivalent qualifications obtained at not more than two (2) sittings. Log on to the HND Application Portal. Fill the form with valid e-mail address and password containing eight (8) characters in alphabets and numbers and print out the Payment Invoice with Remita Retrieval Reference (RRR) Number. Take the printed Payment Invoice to any Bank for the payment of Five Thousand Naira (₦5,000.00) only using the Remita. Go back to the School website (www.fepoda.edu.ng) to complete the registration by clicking on “Finish Registration”. Print out the Application Form, Confidential Report and State of Origin documents. The closing date for the application is 31st October, 2018. All screening exercises for the HND and Remedial candidates will take place at the Federal Polytechnic, Idah and on a date to be announced later. Candidates are to check the Polytechnic website for updates from 1st – 3rd November, 2018.